A FAMILY-OWNED SEATING AND ATHLETIC EQUIPMENT CONSTRUCTION COMPANY. WE OFFER A FULL ARRAY OF PRODUCTS & SERVICES, INCLUDING DESIGN, SALES, PROJECT MANAGEMENT & MAINTENANCE. Our line of fixed audience seating from Hussey Seating Company will meet the needs of any auditorium, theater, place of worship, or outdoor sports facility. We offer a full range of wall attached or portable telescopic bleachers, available with a variety of options to meet the needs of any facility. TJ Distributors is a family owned and operated construction company offering a full array of services and products designed to meet your seating and athletic equipment needs. We serve customers in Delaware, the District of Columbia, Maryland, and Virginia. We offer design, sales, and project management services to end-users, architects, designers, and contractors. Our staff is here to assist you in creating project budgets & schedules, developing specifications, and generating drawings for athletic equipment and seating systems. 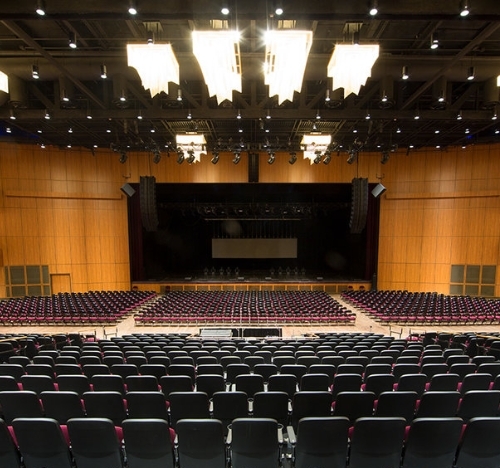 Some of the most highly acclaimed gymnasiums, arenas, recreation centers, amphitheaters, auditoriums, performing arts centers, and churches in the Mid-Atlantic region were designed and installed by our team members. This project included two 99′-6″ banks of Hussey Maxam+ telescoping bleachers with auto folding Metro chairs and cupholders, a 24′ video platform, and graphic logo vinyl end curtains.